The age-old desire to build a strong, well-proportioned physique is still alive and well. Yes, the average gym-goer no longer yearns to build a monstrous, freaky, eye-popping body complete with gnarly veins, huge, stumpy legs and the inability to fit into a dress shirt. But everybody in the gym still wants to build an appreciable amount of muscle and strength. And they want to actually see the results of their hard work without it being hidden under a layer of unwanted body fat. Building an impressive physique not only grants external benefits such as strength, power, and an aesthetically pleasing structure. It also provides many internal benefits: confidence, increased self-esteem, and self-discipline, just to name a few. But with all of the traffic out there regarding specific plans, protocols, and formulas, it’s easy to bang your head against the wall and fall into the black hole of frustration and confusion. Drowning in information makes the temptation to throw in the towel even stronger. Another trap is to become a plan jumper. Are you constantly switching from plan to plan without any real commitment to one for a significant period of time? Do you lack any real results from the last six months of training? How about the last year? You might need to start over. If what you are doing now is working, then by all means don’t stop. But if you’re the type I talked about above, then an intervention may be in order. You may feel comfortable in what you’re doing; you may be strong in certain areas and like that feeling; or you may just be a creature of habit and fear change. Whichever category you fit into, you have to ask yourself a serious question: Is what I’m doing getting me closer to my ultimate goal? The key to building muscle (or any other physical goal for that matter) is to commit wholly to any credible plan and practice discipline, consistency, and persistence with said plan. In other words, it really doesn’t matter what program you choose, as long as it is in line with your goals. It’s up to you to make it work. Pick a plan—any plan—and stick to it for at least six months.Work at it, stay with it, and believe in it. After six months, then and only then can you switch things up or try something new. What you really need in your training are the basics. Throw out all of the super-technical, complex and advanced techniques that just have you spinning your wheels. Some of them may be very effective ways to accelerate your training, but you need to relearn the basics and build a solid foundation first. Start with the moves that enable you to use the most amount of weight and utilize the most amount of muscle mass. Multi-joint, compound exercises like bench presses, shoulder presses, pull ups, rows, deadlifts, squats, and dips are the big boys on the block and will give you the most bang for your buck. Steer clear of exercises like double biceps, high cable curls which yield little-to-no real results in the bigger scheme of things. 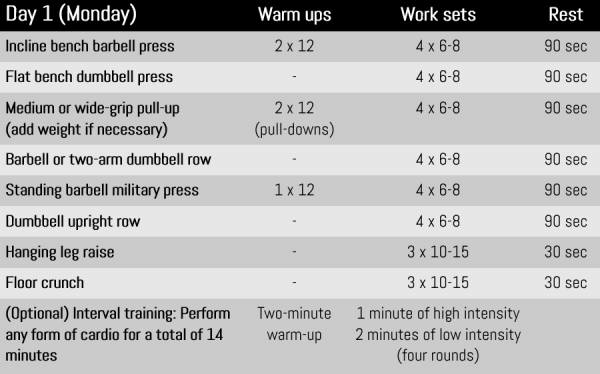 Choose how many days per week you will train. 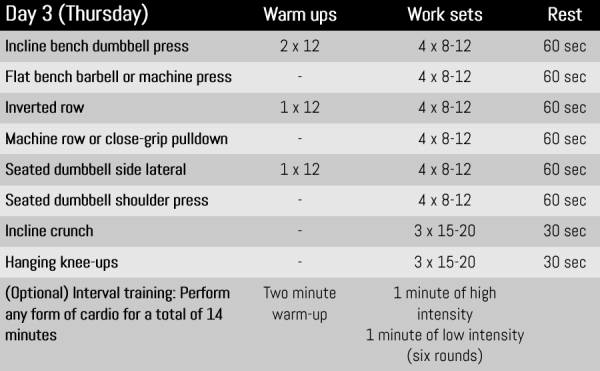 One of the best schedules is to train four times per week. With that in mind, shoot for Monday, Tuesday, Thursday, and Friday with Wednesday and the weekend off. Next, choose your frequency. Training your entire body twice per week with a simple upper/lower split routine makes the most sense for a basic plan. That means chest, back, and shoulders on Mondays and Thursdays and arms and legs on Tuesdays and Fridays. Exercise selection is next. You will want to choose no more than two exercises for larger body parts such as chest, back, and legs and no more than one for smaller areas such as arms, shoulders and calves. Just be sure they are those big, compound exercises we talked about, instead of the smaller isolation moves. Determine volume (sets). Your total amount of volume need not be too high. We tend to do a little more where we excel and cut back on what is hard. Strive for an even playing field, and shoot for four to five sets per exercise. That should have you in and out of the gym in about an hour. Choose a rep range. 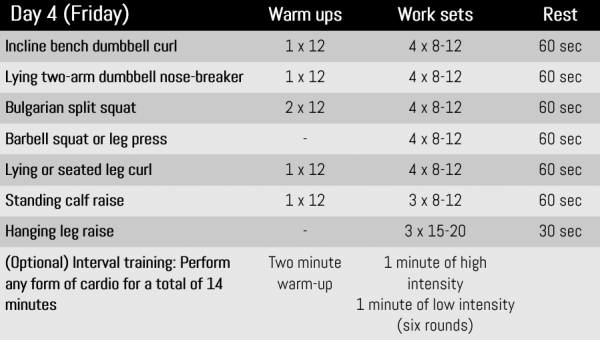 Traditionally, pure strength training follows a lower rep range of 2-6 reps, while hypertrophy (muscle mass) tends to sit in the 6-12 range. Depending on your goal, anywhere from 4-12 reps will be ideal. Don’t forget about rest periods. This factor is one of the most influential in your training. For example, if hypertrophy is the goal, then rest periods of 45-90 seconds are best. Resting too long allows for less fatigue and more time wasted in the gym. Commit to it. Without commitment, all of the planning you painstakingly laid out will be for naught. Make a promise to yourself that you will see this through for at least six months. Nothing is as complicated as the diet-marketing landscape. Every few months, there seems to be a new “greatest diet plan ever,” guaranteed to give you the results you’re after. These plans always seem to be limiting in nature, in that they eliminate certain foods entirely or have you only eating at certain times of the day. Some will even go as far as letting you eat what you want after a specific time. At the end of the day, a balanced diet that includes nutrient-dense proteins, plenty of vegetables and fruits, and some healthy fat sources is always the answer for long-term health benefits and muscle-building purposes. If the latest craze seems too good to be true, it probably is. Determine how often you need to eat. Gone are the days of eating every two hours on the dot. That only creates too much stress and makes you a slave to your eating schedule. At the very least, make sure you are getting in three solid meals with a pre- and post-workout snack. Don’t be afraid of carbs. The bottom line is that you need carbs if you want to build muscle. Be sure they are of the complex kind and avoid any added sugars. Go with rice (white and brown), potatoes (sweet and white), oats, green vegetables, fruits such as apples, bananas, and berries, and whole grain breads and pastas. Start with two grams per pound of bodyweight and then adjust as necessary. Include the right kind of fat. You need healthy fats to balance out your mass gaining diet. Oils naturally found in fish, avocados, nuts, and nut butters are great choices. Shoot for around 0.5 grams per pound to start. Pre- and post-workout nutrition. Its’s important to get in a little something prior to training, especially if you’re the nine-to-five type. This should include a lean protein and a complex carb to get you through your workout. Additionally, it’s a good idea to have some post-workout nutrition on hand immediately after training, which should include a fast-acting protein source and some quick digesting carbs to help the recovery process. Schedule cheat days. What’s a mass-gaining eating plan without a cheat day? If your diet is relatively clean and full of the good stuff, take a meal or two on a weekend (not the whole day) and have anything you want. It will give you something to look forward to at the end of the week, and give you a much-needed mental break. Stay consistent. As with training, you will need to stay consistent with the eating plan as well. A good day or two each week won’t cut it. If you want to pack on some serious muscle, every day counts. 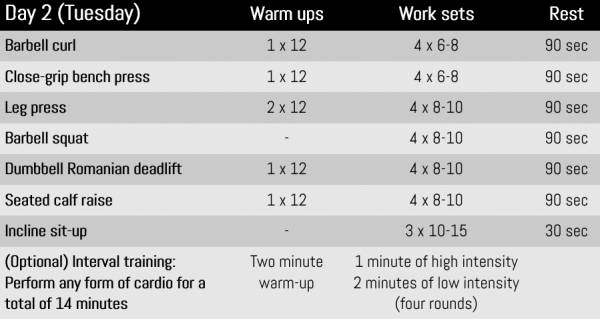 Note: The HIIT cardio can be performed either after your training session, or on an off day (Wednesdays and the weekends). The following eating plan is adequate for the average 180-pound lifter wanting to gain lean amounts of muscle mass. This is only an example, and should be adjusted to fit your specific needs. Next ArticleHow Many Calories Do I Need To Eat Per Day To Build Muscle?